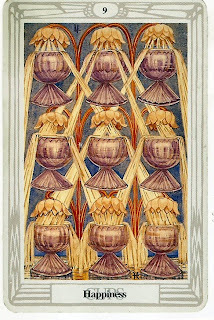 The Nine of Cups. Happiness. Blessing. Emotional fulfillment. Contentment. Joy. Wish fulfillment. Having what one needs. Sensual pleasure. The Nine of Cups corresponds to the Sefirot of Yesod; the Essence of Being and Crystallization. 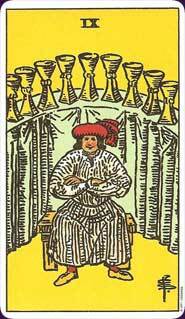 This card is the balancing, central point of the entire energy of the suit of Cups; this is the best the suit has to offer: Happiness. Emotional and wish fulfillment. Sensual pleasure. Contentment. The churning and changing emotions and states of being seen previously have all come together into one, stable, balancing, solid, crystallized energy. The weaknesses of Netzach and Hod have been resolved; Overindulgence and Disrespect have resolved themselves into a sense ofFulfillment and Contentment, Surrender and Corruption have turned about to become a Blessing, and Joy has been restored after a period of fantasy and weariness. You have all that you wanted or need, and are content with where you are. You truly are blessed, and have sensual and emotional pleasure. This card is shining poster boy of the Suit of Cups; it is the essential balance of the suit, and the final positive culmination of its energies. The Rider-Waite illustration shows a fat, happy man sitting in front of a row of gleaming cups. He seems pleasantly satisfied, like a hunter that has just caught a large bit of prey and his licking its chops. He seems almost predatory, but he very clearly has gotten what he wants, and is content. The Thoth art depicts nine orderly, arranged cups, each spewing out glowing water from its brim onto the rest. The water is pure and there isn’t too much of it; the entire system seems to be at a joyous equilibrium, and while there isn’t a a huge overflow of water, there is also a surplus of it; this happiness can be spread to others. In a reading, this card asks you to examine the role of happiness, joy, and fulfillment in your life. Are you content? Are others content? Is your life well-ordered and full of pleasure and having what you need? Are you blessed? Do you have anyone to thank for your blessing? Reversed, this cards energies are blocked; you are on the verge of achieving this happiness, but something is stopping you, or the happy and joyous energy is twisted and perhaps corrupted somehow; is your happiness hurting others?